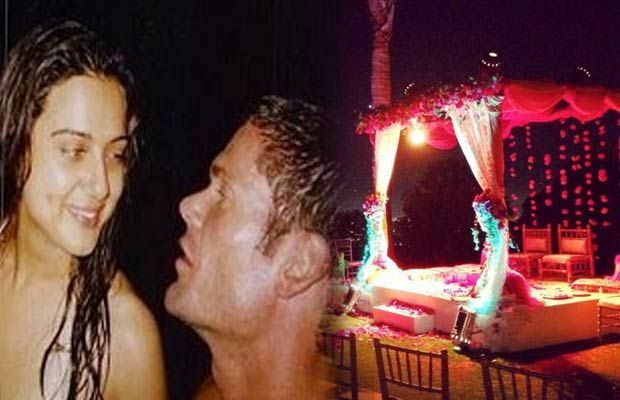 Bollywood actress Preity Zinta is finally hitched to her boyfriend Gene Goodenough. The actress, who always kept mum about her relationship, got married in Los Angeles in a private affair. Preity and Gene were dating for a while now. The actress never made her relationship public because of her sour break-up with businessman Ness Wadia. In the presence of few family members and friends, Preity Zinta took a major step in her life. Her close friends Sussanne Khan and Surily Goel attended the intimate wedding ceremony. Both the wedding date and venue were kept under wraps. But we got hands on the wedding venue photo which leaked earlier this afternoon. From the picture, it seems the wedding was both traditional and western. Some reports suggest that the ‘Veer-Zara’ actress is planning to have a big reception in April for all her friends in Bollywood. Though, no official statement has come from the groom or the bride, we can only expect for some pictures going viral on social media. All we can say is congratulations on the wedding. We shall keep you updated on it.